The Cleaner was one of the few solid programs back in the good old days to clean malicious software from a Windows computer system. It somehow seems to have lost its appeal to many users even though the developer's claim that it is the fastest anti-virus solution with best virus detection rates available for the Windows operating system. The Cleaner is an antivirus software, not a suite which means it does not offer a firewall, email spam scanning or any of the other modules that security suites offer. It can therefor be best compared to other standalone antivirus solutions such as AVG 9 or Avast. The developers have divided the program into a scanner and a resident program, both highly compatible with other antivirus solutions installed on the computer system. The program uses a database of malicious software plus advanced heuristics to detect known and unknown threats on a computer system. 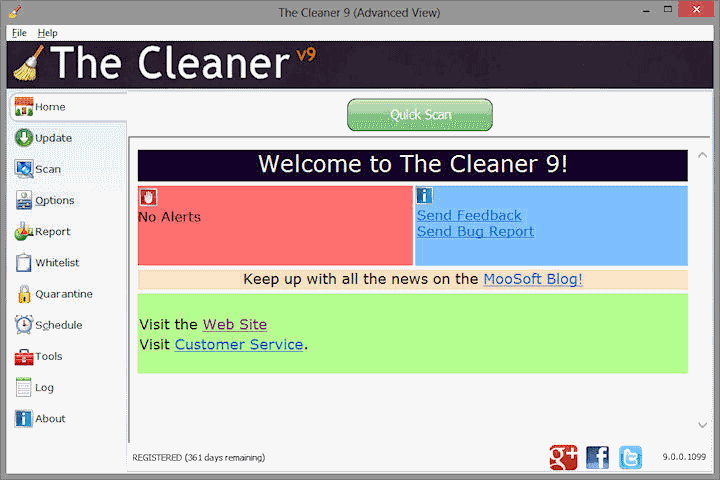 The interface of The Cleaner 9 lists available sections on the left, and an action area on the right. The left side lists options to check for updates, run scans, look at old reports, manage the quarantine list and schedule, or manage the whitelist. The tab driven program is easy to use. You may want to start with a click on the Update tab to update the program's database, something that does not seem to be handled automatically by the antivirus software. The scan tab provides options to perform a smart scan that will only scan popular locations for malware or full scan which will scan all files and locations on the hard drives that are selected by the user. The only other options provided are to change the heuristics level from relaxed to paranoid in a slider, to whitelist files so that they are not scanned by the software and to take a look at reports and the log. The Cleaner in this regard is therefore a solid addition to any security setup a user might already have installed on the computer system. A trial version is provided on the developer website which supports detecting and removing malware, and the program's one-click fix option. It lacks the real-time malware protection module, and scheduling of updates or scan jobs. You may however want to give it a whirl to make sure the program is compatible with your setup before you make a buying decision. Update: Please note that the last release version of The Cleaner dates back to 2013. It appears as if development has stopped, but that has not been confirmed by the developing company. Hi, you corrected some mistakes but the biggest still remains. Its not an antivirus. Its intended to protect against other malwares which are not viruses.